Not only did he spend his day racing, he spent rest of his day running around the race track with some new friends. All of our hard work paid off last weekend and Jason “won” his first race. (We don’t really keep score with Kid Karts.) While there were only two other racers it is still an accomplishment, since this was his first day on this track. Still lots of work to do in order to stay competitive. We are off to a great start and the next race should be more challenging with more racers. The race day format consists of practice sessions followed by 2 heats and then a final. Jason won the first heat and came in second in the second heat after a bobbled corner. He was passed by both of the other drivers, though one was already lapped and still technically behind him. The final race was very exciting with lead changes and passing. After bobbling corner #1 Jason was passed by #84, who was on the same lap. Jason stuck with him and was able to pass as they both lapped #4 during a three kart wide run down the front straight. Just a few more laps to go and he just needed to run clean. Jason had built a lead of 10 or so kart lengths and the checkered flag was flying as he came out of he final corner. Then a horrible clanging sound came from the kart. He pressed on the gas, the engine raced and nothing happened at the wheels. The drive chain had fallen off! 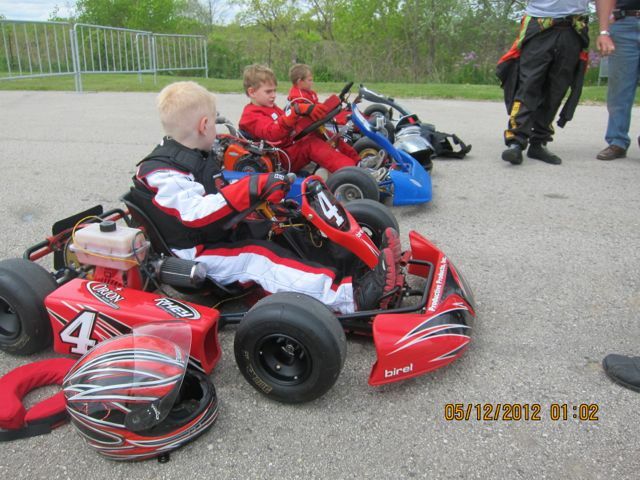 As the the karts came up fast from behind, Jason’s kart started to slow. Just as #84 was about to reach him, Jason coasted across the finish line to get the win. Back in the pits I found the chain was a bit too loose and had jumped the sprocket.